Study: Do Parents Cause Fussy Eating? Home » Study: Do Parents Cause Fussy Eating? Picky eaters; many households have them. In my house it’s my husband. But, if your picky eater happens to be a child, listen to this. Parents might be making them pickier. A study, conducted by Jane Wardle and others at the University College London and published in the Journal of the American Dietetic Association, has found that parents who try to restrict unhealthy foods may produce fussy eaters and parents who try to restrict food quantities may produce children who overeat. The study involved a survey of 213 mothers whose children were between the ages of 7- and 9-years-old. The respondents were asked to assess their children’s responses to food i.e. : did they overeat if they were given the opportunity, did they eat slowly or did they frequently leave their food unfinished. 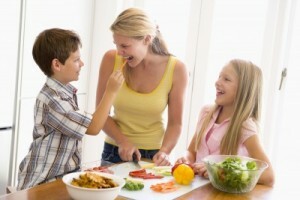 They were also asked to analyze their own strategies to their children’s mealtime habits i.e. : did they attempt to make their children eat, even when they weren’t hungry and did they believe their children would overeat if there weren’t parental restrictions in place. Wardle and her fellow researchers found a correlation between parental pressure to eat healthfully and the degree to which children become picky eaters. They also found that the more a mother restricted food, the more likely the mother was to report that her children would overeat, given the chance. These correlations were seen irrespective of the children’s weight. Wardle acknowledges that these findings don’t necessarily mean that parents’ are causing their children to overeat or be fussy eaters. Rather, parent’s strategies may be a response to behaviours the child is already exhibiting. Jimmie Johnson Celebrates Fifth Nascar Title With His Family!